This week “Sheriff” from Tiraspol will play two home matches. Tomorrow “yellow-blacks” will meet “Iskra-Stal” from Rybnitsa in the semi-final of the Cup of Moldova, and on Saturday they will play with “Rapid” from Gidigich in the framework of National championship. Both matches will be played on the Covered arena because there are scale repair-building works now on the Main and the Small arenas of the “Sheriff” sports complex. 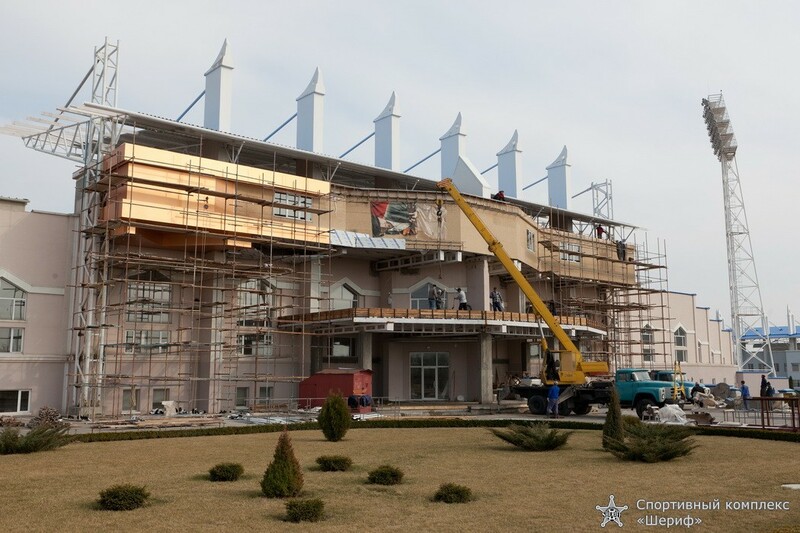 We decided to talk to Petr Vasilyevich Lyalyuk, the director of the sports complex, about these works. Petr Vasilyevich, tell us about repair-building works which are on the Main and the Small arenas of the sports complex. – Let’s begin with works on the Main arena. Here the complex of changes is quite extensive. Firstly, we have changed football ground on the arena which is still in the grassy surface vegetation process. Together with new field we also improved drainage, watering and heating systems. The reconstruction of football ground is ended. Its size was 72 to 109 meters earlier. According to last UEFA recommendations the football ground size should be 80 to 120 meters that was realized on the Main arena. This is not a requirement yet, there are few grounds of such size in the world. Nevertheless, the decision to come to a new standard in order to keep step with advanced football Europe has been made. Furthermore, there are construction works on re-equipment of central entrances on both tribunes now. A so-called “exclusive zone for visitors” which should not be less than 400 sq. 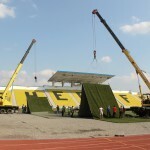 m. according to UEFA regulations for the highest category stadiums is being built at the western tribune. At the eastern tribune we reconstruct the facade in order to give to it smart and aesthetically more beautiful appearance. All equipment is being changed as it was set on early 2000s when the stadium only began to function and that is why it needs to be changed for modern standards. Summing up, we can say that we are making scale works on the Main arena, general aim of which is to adjust it in accordance with advanced technical standards. We make it even more comfortable for all spectators including people with limited abilities for whom all conditions for comfortable and pleasant pastime on our stadium are also made. You have mentioned about football ground change among other works. What can you say about its quality and what is the cause of this change? – Previous football ground was spread on 2002, and after 8-year period of exploitation it doesn’t correspond to quality standards which demands today to football ground any more. Even the application of all modern technical means and football ground quality maintenance technologies which we have didn’t give proper result. That is why we decided to spread new ground. It was made by Austrian technology (one of the best in the Europe) and was brought to Tiraspol in autumn (we didn’t want to bring it in spring in order not to have problems with grassy covering growth), then it was kept on a temporary area. At present,the football ground is already spread on the main arena. What changes are taking place on the Small arena? – At the moment there are construction works at the whole Small arena. First of all, this is due to the fact that we want to raise the category of this arena from two to three (there are four of them). It will allow us to play here even euro cups matches. The UEFA regulations make definite demands to stadiums of this category, that’s why the main aim of the Small arena changes is to meet these requirements. Firstly, natural grass of the similar with the Main arena quality is spread on this arena. As you know, the Small arena was equipped with artificial surface earlier but growing demand of FC ”Sheriff” and FC “Sheriff-2” on natural grass made us doing such changes. 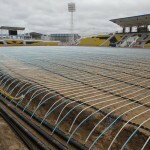 Heating and automated watering system together with natural grass were set on the Small arena. We didn’t have it here earlier. There is also great work under increasing of VIP-boxes and all those premises which are provided by UEFA Regulations for qualitative carrying out of high level football matches. When will the Main and the Small arenas be ready to carry out matches? 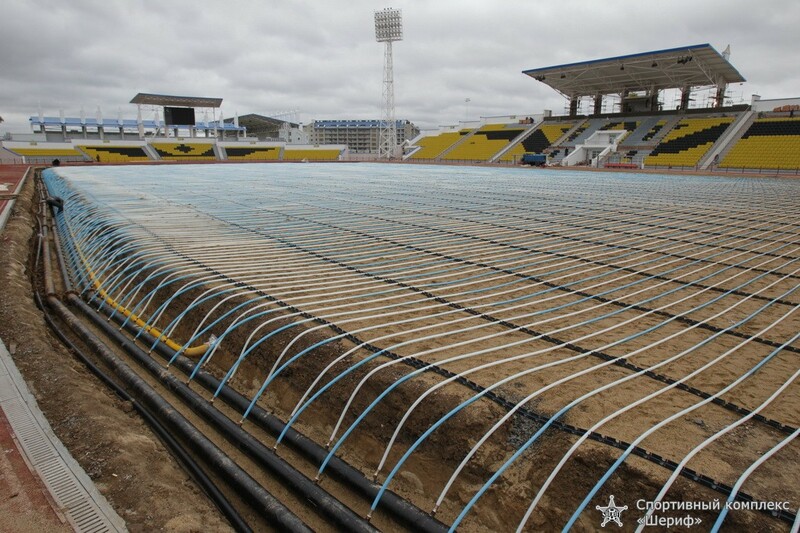 – All works at the Small arena are planned to be ended at the beginning of May. Accordingly, from this time it will already to be ready for carrying out football matches. As to the Main arena, here terms are little later, the tentative date is July. Petr Vasilyevich, it happens so that FC “Sheriff” plays matches on training field because of defined conditions and circumstances. This deprives fans of possibility to watch the game of favorite team. In this connection, don’t you have plans to construct little tribune for, let’s say, 500 persons in order to give spectators possibility to attend match? – There are defined ideas in this direction. I can say that we don’t except plans of such tribune construction. What else projects are realizing now at the SC ”Sheriff”? – Now we have a row of ideas and projects which either will or already began to realize at the moment. For example, we are working on creating the FC “Sheriff” club museum. In spite of a short history of the team, it have already won quite a few trophies and titles, and also declared about itself on the international arena loudly. The club museum must become a reflection of all these successes. I think this will be interesting for fans of FC “Sheriff”.